I was in college playing football when I developed a “slipped disc.” In my case it came on gradually over a few years. The pain was so intense that I couldn’t walk, sit or stand without severe pain. I was afraid that I would not be able to play football again and I would lose my college scholarship. After considering surgery (that was the only option, according to the surgeon), I decided against it. A friend of mine convinced me to give a chiropractor a try. The chiropractor did an exam, took some films and then “adjusted” my spine. The adjustment didn’t hurt, it actually felt good. I got relief and I could play football again. It worked so well that I went to chiropractic college myself. It’s strange how life works out, because now people come to see me with their disc problems. Also they come to me with headaches, migraines, chronic pain, neck pain, shoulder/arm pain, whiplash from car accidents, backaches, numbness in the limbs, athletic injuries, just to name a few. I have a B.A. Degree from Mid-America Nazarene College in Olathe, Kansas, as well as a Doctor of Chiropractic Degree from Palmer College of Chiropractic in Davenport, Iowa. Palmer College is the first and most recognized chiropractic college in the world. I was an instructor at Palmer Chiropractic College in Radiology and Diagnosis. I then became an associate with one of the largest chiropractic clinics in Texas for six years before coming to Bermuda in March 1995. I have also had extensive post-graduate work in the management and treatment of neck and low back pain, headaches, sports injuries, radiology, biomechanics, exercise physiology and nutrition. I wanted to be a chiropractor to make a real impact on people’s health. By treating the cause of their problem and not just cover up the pain, I am able to achieve this. While at school I was truly amazed by the inner working of the human body and how we can affect overall health by dealing with the spine and nervous system. 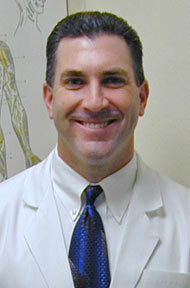 While an associate chiropractor in Texas for six years, I gained valuable experience from my mentor, Dr. Mark Brown. He taught me to treat each person, janitor or CEO, with the same care and respect and to see all people as not greater or less than one another, to simply see a human being in need and to bond with each patient, step into their shoes and perceive their needs. I have been married to my wife, Tina, for 12 years and have been blessed to live in Bermuda since 1995. We have two sons, aged 19 and 20, and two daughters, aged 20 and 21. I would never recommend anything to my patients that I was not willing to do myself. Therefore, I make time on a daily basis to exercise, eat healthy food, drink plenty of water, take vitamins and receive ongoing maintenance adjustments myself whenever possible. Enough about me! How can we help you with today’s safe and natural chiropractic care? Give us a call at 236-1353 so we can help you take your first step towards better health.